If you want it to work on 3.50 or 3.42 you need to downgrade the PS3. You can do this by using PS Jailbreaks program called "PSDowngrade" which is FREE and unlimited with all PS Jailbreaks! You MUST have an original PS Jailbreak to use this software. Each dongle has a special serial number that is verified during the process of downgrading. Overview for PS Downgrade : The wait is finally over! New users above 3.41 fw its time to join in on the fun. Thanks to PS Downgrade, PS Jailbreak is now available for all 44 million users. PS Downgrade is a software add on that connects with your existing PS Jailbreak device. In 1 minute or less you can downgrade your consoles firmware to any previous firmware. Simple to install; just plug PS Jailbreak into your pc and follow the gui to install PS Downgrade. Works with all past, present and future firmwares! Turn back your console to 3.41 to jailbreak with the worlds original PS Jailbreak, or even go as far back as 3.12 to enjoy Other OS (yes LINUX is back). Completely safe to use, and does not void your warranty. PS Downgrade is completely undetecable by manufacturer, there is no history or log of your downgrade. Please note: PS Downgrade is ONLY compatible with original PS Jailbreak, no clones or inferior USB dongles. Turn back your console to 3.41 to jailbreak with the worlds original PS Jailbreak, or even go as far back as 3.12 to enjoy Other OS (yes LINUX is back). Completely safe to use, and does not void your warranty. PS Downgrade is completely undetectable by manufacturer, there is no history or log of your downgrade. Please note: PS Downgrade is ONLY compatible with original PS Jailbreak, no clones or inferior USB dongles. Quality/Usability : I will be splitting this review into two parts. First part will be about the PS Jailbreak itself and the second part will be about the PS Downgrade. This does not work on Sony's new firmware 3.55. Unrar/Unzip PSUpdater.zip and click on "setup.exe"
Plug the PS Jailbreak device into a USB port on your computer and click "Next"
Choose "Unknown Device #1" from the list and click "Next"
Click on "Download Updates" tab and then click on "Download updates"
Click "Update Now" tab and click "Click here to select file..."
Choose the downgrader file (downgrader_SerialNumber.fla) and click "Apply Update"
After using PS Downgrade to lower your firmware (see below for instructions), please follow the above steps this time choosing to apply update file "prog_SerialNumber.fla"
Turn on the console using the same boot method as PS Jailbreak: Press power then immediately press eject. Your console will turn on and PS Jailbreak will light up with red/green LEDs followed by green only, then the PS3 will turn off. Remove PS Jailbreak dongle and turn on console to make sure you are in Factory Service Mode. You will see a huge red box on the screen saying Factory Service Mode. These must be the only files on the USB key and must be placed in the main (root) directory. Insert flash drive into the last USB port to the right — the first USB port in from the right side if you’re facing the console. Turn the PS3 on and you will see black screen but the PS3 HDD light will flash. The process takes 3-4 minutes for the system to install the old firmware. Towards the end, the power button on the console will start flashing green and then your console will power off. Remove the flash drive and turn on the console, you will still be in Factory Service Mode. Please verify you have downgraded successfully to version 3.41 by going to "System Information". (Optional) – If you wish to downgrade to any older firmware (such as 3.15) you can follow step 4, 5, 6 using any regular firmware PUP. (You do not need to use modified custom firmware now that you are on 3.41). Insert USB flash drive back into your PC and delete the PUP and Lv2Diag.self file (File 1) and copy the other Lv2Diag.self (File 2) to the root of the flash drive. Insert USB flash drive back into the same USB port on the PS3 and power on your PS3. After 10 seconds it will power off. Remove USB flash drive and turn on your console again. You will be out of factory service mode and back in retail mode with your chosen firmware version installed. You will need to go through setting up settings configuration. With this you’re able to downgrade any PS3 running firmware 3.42 or 3.50. If you currently own or use to own a PSP, this is kind of similar to that of the Pandora Battery where you take a Sony battery (or compatible battery), load some files onto a memory stick and both combined, you're able to unbrick your PSP. PS Jailbreak was originally charging $40 for a one-time downgrade. So if you wanted to downgrade another PS3, you would have to pay another $40. A lot of people did not like this idea and a couple of weeks later, the team decided to release the downgrade with unlimited use. This means you can downgrade as many PS3 systems as you want without paying additional. Conclusion : Overall, the Original PS Downgrade PSDowngrade is the first downgrader to hit the hacking scene for the PlayStation 3. Not only does it allow you to downgrade 3.42, 3.50 to 3.41, but you're also able to downgrade to 3.15 and bring back OtherOS. In order to downgrade, you'll need to own an authentic PS Jailbreak and it will cost you a whopping $99 (use to be $180-$150). Pretty hefty for a jailbreak device but that's the price you pay to be the first. PSJB team was originally charging $40 for a one-time use coupon to downgrade a PS3, once. So if you wanted to downgrade another PS3, you would have to fork over another $40. But after many complaints and dislike for this pricing (maybe also because a free solution was soon to be released), PSJB team decided to lower the price of the PS Jailbreak and included unlimited downgrades. Even though PS Updater v1.3 was suppose to fix problems for those running on Windows 7 64bit, I still ended up having problems. Installation and driver installation was all successful and I was able to get the .fla files but when it came to updating my dongle with either .fla files, I got a "FLASH FAILED" error message. I've tried everything I could possibly think of, even using a ProxyPS method and it could not open the .fla file. However, performing the same installation on a Windows Vista 32bit, I had no problem at all and the flash was successful. Luckily, I had an extra computer running Vista in the house. So this may be a problem if you encounter a problem and don't have another computer with Vista. The PS Updater program only works on Window's OS. I would like to see some support for other operating systems as not everyone owns a PC. 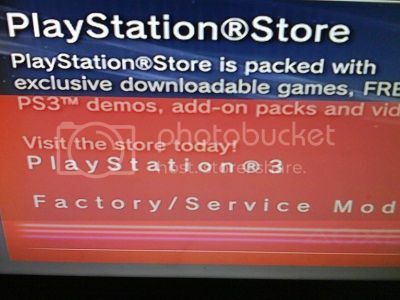 *NOTE: As of 12/6/2010, Sony released a new firmware 3.55 that blocks the use of the downgrader. The Lv2Diag.self File 1 has been revoked. However, if you were unaware of this and tried to downgrade, Sony left Lv2Diag.self File 2 alone so users can get out of FACTORY SERVICE MODE and back to normal state so you can continue to play your games and access PSN. If you own 3.42-3.50 firmware, this still works.